Last week’s incredible Cloud UK Live event brought together cloud specialists, solutions architects and business leaders to explore the world of cloud. If you missed out on the expert talks, panel discussions and workshops on the day, don’t worry! You can catch up on all the action in today’s blog. 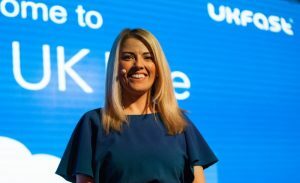 What were the key takeaways from Cloud UK Live? Inma Martinez, keynote speaker and world-leading technology expert, kicked off the morning with a fascinating introductory talk focussed on big data. She explored how we can best use the cloud to extract and analyse data efficiently. According to Inma, soon all home devices are predicted to integrate sensors. These sensors will feed data back to the manufacturer through the cloud, ready for interpretation and development. This in turn will enhance the integration of machine learning into the everyday. Not all clouds are created equal. With so many offerings out there now it’s important to make sure you choose the best cloud solution for your business, which correlates most suitably with your APIs. Dr Chris Folkerd, Director of Enterprise Technologies at UKFast, highlighted numerous reasons why moving to the cloud is advantageous. Cloud allows for greater scalability, flexibility, cost-effectiveness and speed than on-premise solutions. He said: “What’s important to recognise is that cloud adoption is a journey. There is no need to migrate wholly to the cloud in one transition. Trial services where you can and test which offerings and solutions work best for your business. Not all clouds do all things, and choosing a solution can be overwhelming. But forming a good partnership with your hosting provider is half the battle. Our UKFast ‘Every Cloud’ panel discussion emphasised the significance of building trusted relationships when migrating to the cloud. It’s crucial your provider knows your business inside out so that they can cater specifically to your business aims and provide a solution bespoke to your organisation. An eCommerce customer needs to be able to plan as well as react to spikes in traffic during peak times. With the right cloud solution and support system in place, preparing and predictably scaling up to cope with such instances is achievable. We live in an impatient world. With that comes the need to transform and synthesise data into insights to succeed in an ever-changing, fast-paced environment. Through the cloud, we are capturing data in real time across every aspect of our lives. This is driven, according to James Greenham of HPE, by a new generation of apps and accelerated business models with new requirements. Such technology means data needs to be turned into insights by deriving valuable learning and using it to augment the performance of humans with machine learning and AI. Take autonomous cars as an example. Certain data generated by a driverless vehicle, like internal control features, can afford a delay on their processing time, whilst others need to be processed in real time, like the reaction of the brakes to an obstruction in the road. The cloud has changed the way we consider data security. The reach of cybercriminals is greater than ever and third parties are commonly targeted by attacks. He highlighted three ways through which this is achievable. Change the mindset around breaches by acknowledging that security is a company-wide issue. Implement security solutions and become aware of your business’ IT hygiene. Educate your staff on cybersecurity both now and in the future as cloud continues to grow. If you want to discover more about how cloud can accelerate your business, check out our cloud hosting services today.